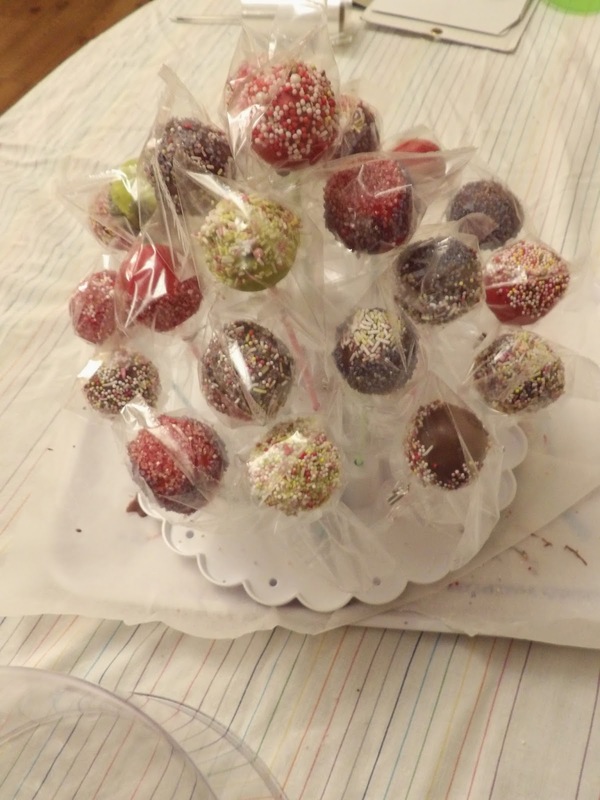 Today I made cake pops for a charity sale tomorrow. It will be raising money for Bliss, a charity that supports families of "babies born too soon, too small, too sick". Here are some "production photos"! Cola cake (from Marian Keyes' Saved by Cake) mixed with one or two tablespoons of the cola icing. Roll it into balls (about the size of a ping pong ball) then put into the freezer for 10 mins. A few candy drops melted over a bain marie. 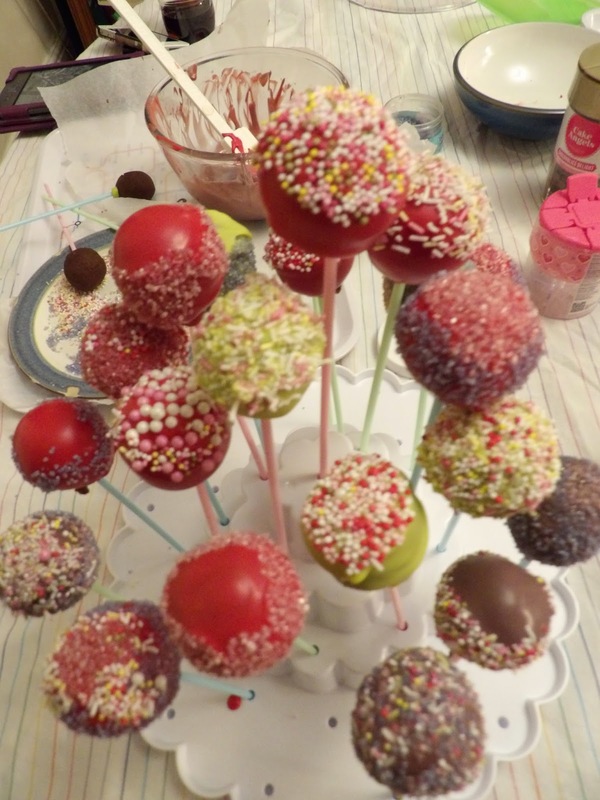 Dip a pop stick in the melted candy then insert into a cake ball, laying the pops flat on a tray. 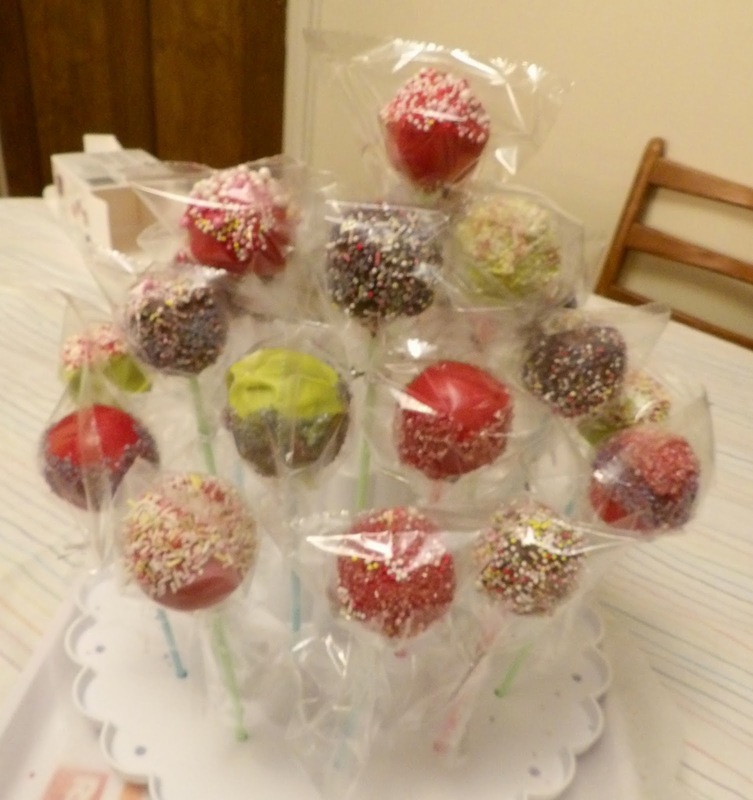 Once every cake ball has a pop stick, put the tray in the fridge for the candy melts to set. Melt more candy drops over a bain marie (I always use this method after the great microwave candy seizing disaster of 2012). Put your sprinkles in dishes to make them accessible for dipping. Coat each pop with a layer of melted candy and hold it over the bowl while it sets enough to no longer be dripping. Then dunk into whichever sprinkles you want. If you don't have a cake pop stand (I bought this one the other day from Lakeland), an inverted colander works really well to hold the pops while the chocolate dries. I hope they raise some money for Bliss and help them in their important work with poorly babies.